There were at least three awesome social change conferences this week! The week started off with a bang with Social Capital Markets. The SoCap08 blog team did an excellent job covering this 3-day event. You can also check out a few videos from SoCap08 on Fora.tv here. The Feast’s Social Innovation Conference was also this week and SwissMiss has some great notes on the event here. 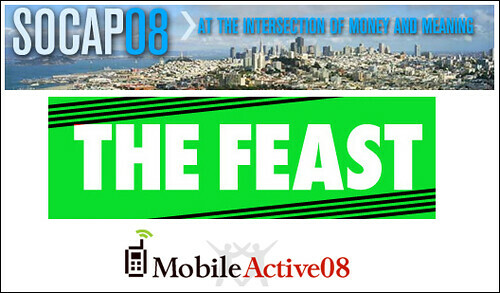 And over at ReadWriteWeb, you can check out a review of MobileActive08. The application deadline for the next “Kiva Fellows Program” is Nov. 1st. Winners Announced for American Express Members’ Project – DonorsChoose.org came in 2nd, Kiva.org 3rd! Nate Ritter and team prepare to launch CrisisWire.com – “Emergency, Disaster and Crisis Information in Real Time” Watch a video here and you can can vote for it on IdeaBlob here. Get the AllTop Nonprofit Widget – Share the latest news from AllTop’s top nonprofit blogs. Instant Grants: Just Add Funding and Stir – Group gives away $1,000 in NYC’s Union Square Park, in the form of mini-grants for artists – Great post + video! SocialActions Announces New Logo Contest: Can you imagine a logo that reflects the energy & purpose of SocialActions’ mission and is instantly recognizable and memorable? SocialActions is getting a total re-design and invites you to create our new logo (and win $500!). The deadline for submission is Nov. 2nd. Read more about submitting your design here. You can also vote on the current submissions here. Social Actions is also organizing a Lunch for Social Action Platforms On Oct 20th in the Bay Area. Blog Action Day was this past Wednesday – over 10,000 bloggers raised awareness of issues surrounding poverty in a single day! Now you can continue to raise awareness about poverty by adding a “Take Action on Poverty” widget to your blog or social network. New: You can also tag your delicious bookmarks with “p2pchange” or include “#p2pchange” in your tweets – for inclusion in future Social Action Roundups. What a fantastic roundup – and thanks so much for the mention!